(L36" x H25" X D22") Stained and finished inside and out with painted panels, pinstripes, logos etc. 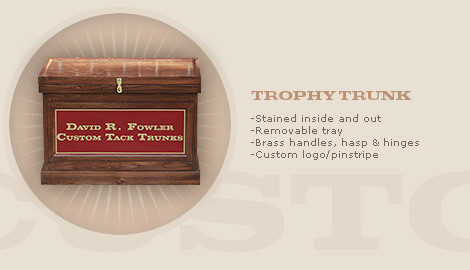 This tack trunk is a real show piece! (L33" x H18.25" x D18.75") Stained and finished inside and out with painted panels, pinstripes, logos etc. 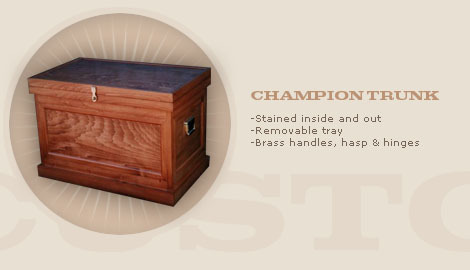 (L36" x H25" x D22") Built the same as the Trophy Trunk above, except that it is stained only (no painted panels, logos, etc.). Looks beautiful with a brass name plate. 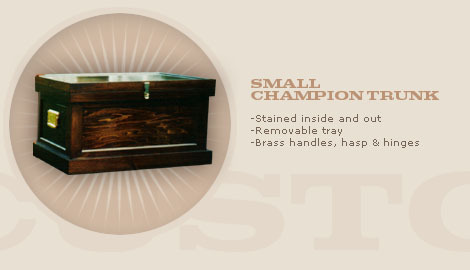 (L33" x H18.25" x D18.75") Built the same as our Small Trophy Trunk. Stained and sealed only. (L36" x H22" x D20") Simpler in style. 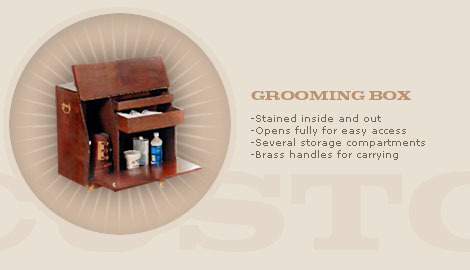 Stained and sealed inside and out, comes with removable tray. Built with the same sturdy construction and heavy duty hardware as all of the above trunks—this is the perfect trunk to take "on the road". (L23.5" x H20" x D13") Stained and sealed inside and out. 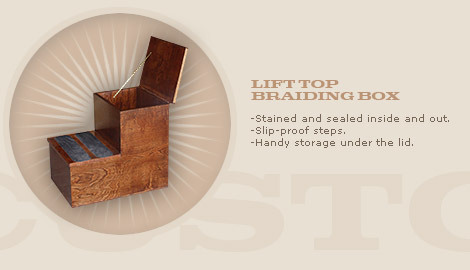 Multiple storage compartments and drawers. Handles make it easy to take on the road. (W24" x H32" x D8") Stained and sealed inside and out. Keeps pillow wraps separate from polos, flannels, etc. 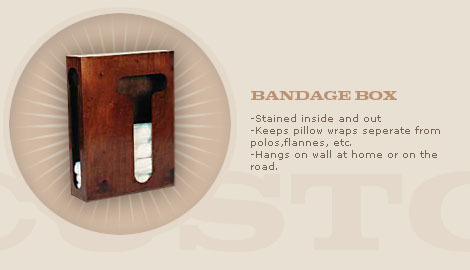 (H21.5") A handy accessory at home or on the road. Can be used as a Mounting Block as well. (H72" x W17.5") Stained and sealed on all sides with sturdy metal brackets. Easily dismantled and re-assembled. May be hung on fence or other stationary wall. 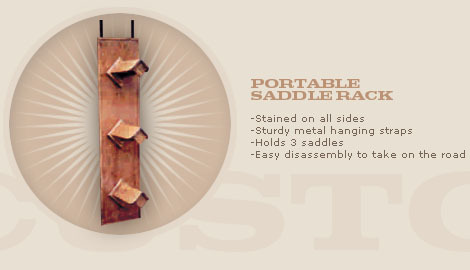 Holds 3 saddles. (H48" x W17.5") Stained and sealed on all sides with sturdy metal brackets. Easily dismantled and re-assembled. May be hung on fence or other stationary wall. 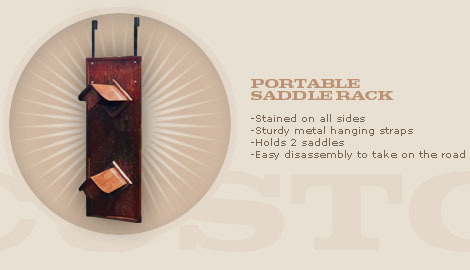 Holds 2 saddles. (L42" x H9") Stained and sealed on all sides with sturdy metal brackets. May be hung on fence or other stationary wall. 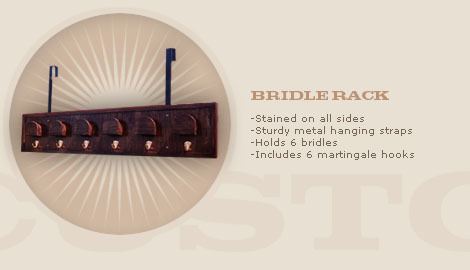 Holds 6 bridles with martingale hooks. May be customized. (H12" x W13.75") Stained and sealed inside and out. 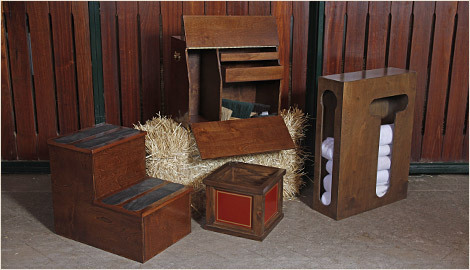 The perfect finishing touch for your tack room display. Great for large plants/potted bushes. Fits inside all large trunks. 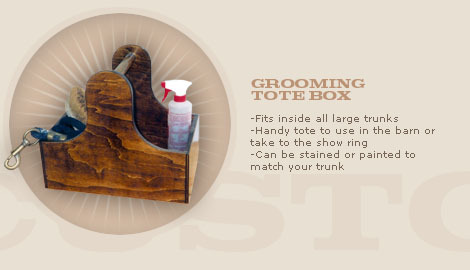 Handy tote to use in the barn or take to the show ring. 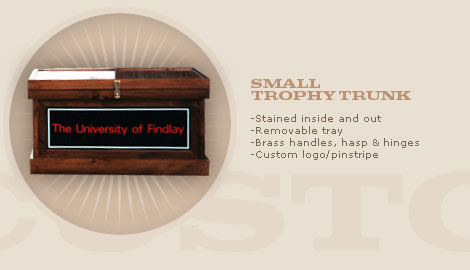 Can be stained or painted to match your trunk. 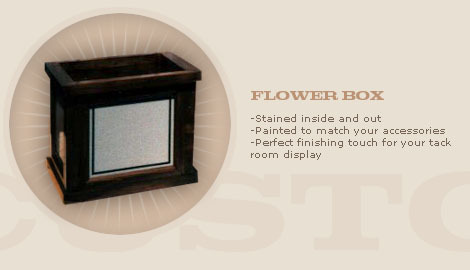 Stain Options: We use Minwax Wood Finish. View the available color choices. Terms: We now accept MasterCard and Visa! 50% deposit required at time of order by credit card, personal check, bank draft or money order. You will be notified when your order is ready for shipping, at which time the balance will be due, including shipping costs and applicable Sales Taxes.